This season I have partnered with TiqIQ to bring you '81 days in 203'. a series of articles breaking down the life of a super fan. '81 days in 203' articles will be featured on various Yankees blogs within the TiqIQ network of blogs and will be posted throughout the 2013 season. They now offer tickets directly from the Yankees ticket exchange, the official resale marketplace of the New York Yankees. Let me start this post by saying that I'm not a fan of Birthdays. Unless you are like, ten years old, you should not be making a big deal about the day you came into this world (notable exceptions for the 18th and 21st, but that's about it). 30 isn't really a milestone, and 40 is the new 30. If you clock in at 50, go ahead, you deserve to celebrate. And don't get me started on the people who insist on having "birthday weeks" or taking the day off from work on their Birthday! 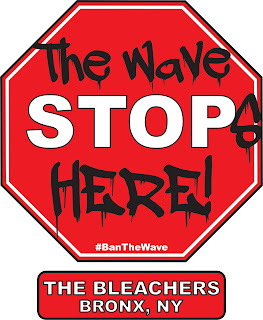 It's pretty well known how much I despise The Wave, so I thought that maybe for ONE DAY this year, The Stadium could go Wave Free. I know it's a tall task, but if I get the word out early enough, I think we could succeed! So, please spread the word to anyone you know going to the game on September 25th. I know Section 203 has The Wave shut-down, but we're going to need plenty of sleeper cells in the other sections to make sure The Wave STOPS Here! Thank you in advance for helping stomp out this terrible epidemic. With your support, we can be sure The Wave ends once and for all! If you need tickets to the 9/25 game, my buddies at TiqIq have you covered. Check out the available tickets here.